July 7, 2016 – New York, NY – ComiXology, Amazon’s premier digital comic shopping & reading platform, announced today its exclusive 2016 Comic Con International promotion giveaway: “Comic Book All Stars” collectible trading cards. 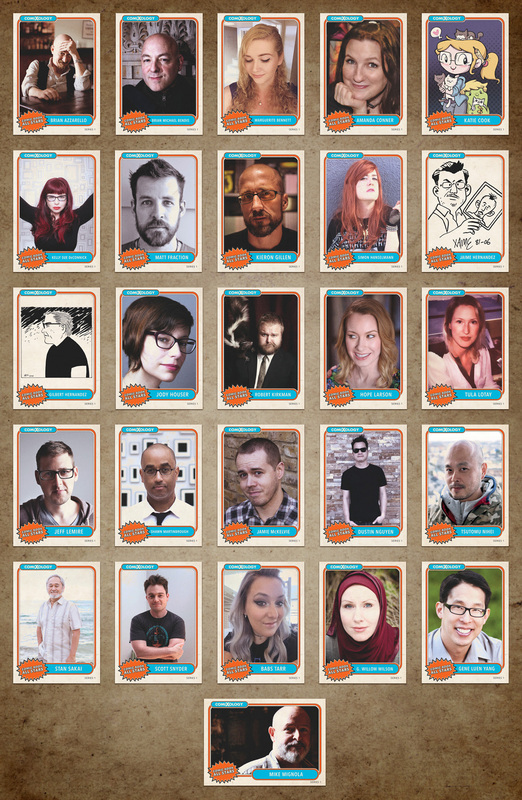 Each of the 26 cards will spotlight a photo or self-portrait by fan-favorite comic book creators like The Walking Dead creator Robert Kirkman, Love & Rockets cartoonists Gilbert and Jaime Hernandez, acclaimed Ms. Marvel writer G. Willow Wilson, and the national ambassador for young people’s literature, cartoonist Gene Yang. Each card includes a redemption code for a free title on comixology.com that has been handpicked by the spotlighted creator. 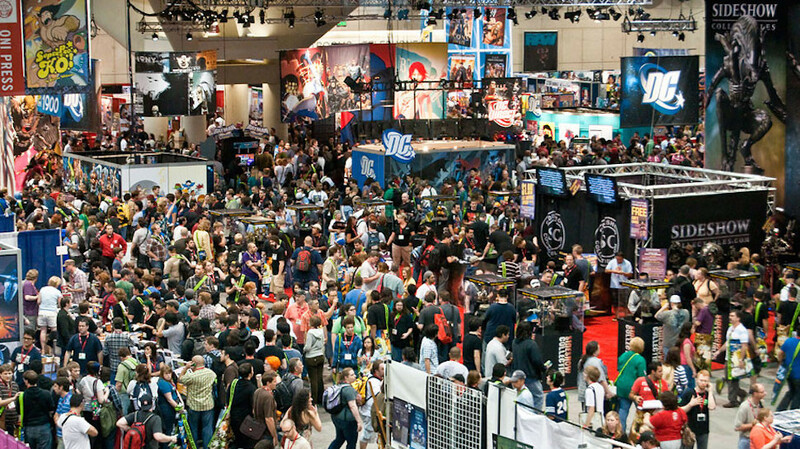 Comic-Con International takes place in San Diego, CA. from July 20th – 24th with comiXology exhibiting at booth #2547. 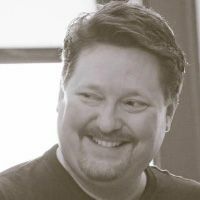 ComiXology will be hosting ten panels this year at the show and during every panel a limited supply of trading cards, as well as Kindle Fire HD devices, will be given out to lucky attendees. 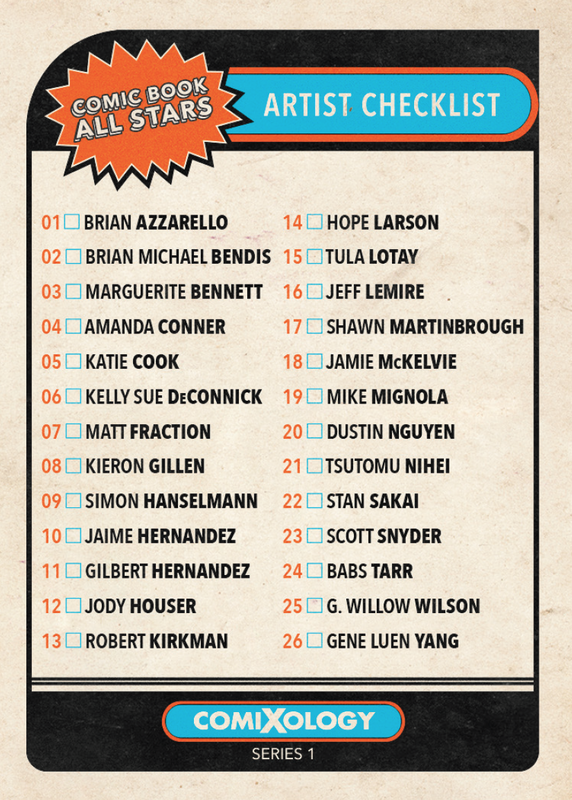 The “Comic Book All Stars” collectible trading cards will also be available at designated times during the convention at the comiXology Booth. The company will be announcing creator signings and card drops via social media and its Tumblr closer to the convention. ComiXology, an Amazon.com, Inc. subsidiary (NASDAQ:AMZN), is a revolutionary, cloud-based digital comics platform. With content from over 125 publishers as well as thousands of independent creators from around the world, comiXology provides an unrivaled library of comic books, graphic novels, manga and bandes dessinées. The company’s first in class innovations include the exclusive Guided View technology which provides an immersive and cinematic reading experience and a new monthly subscription service. ComiXology is based in New York City, with operations in Seattle, Los Angeles and Paris. For more information visit comixology.com and follow the company on Twitter, Facebook and Tumblr.